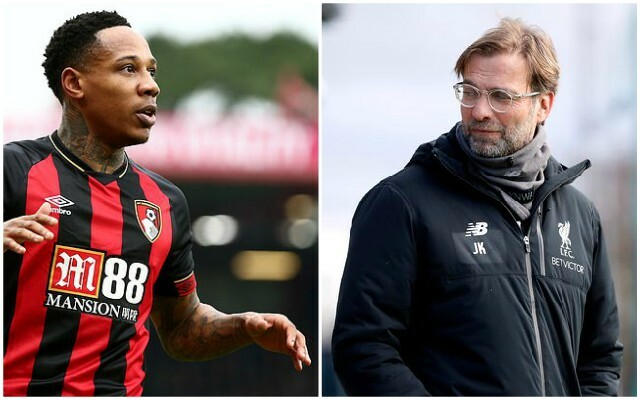 Having failed to impress Jürgen Klopp earlier this season, on-loan Bournemouth right-back Nathaniel Clyne has suggested that the Premier League is there for the taking for the Reds. Watching Liverpool’s full-tilt title challenge from the South Coast, the 27-year-old defender has told Sky Sports News that his parent club “definitely” have the players to see the next eleven games through to the end. “You can see right now in the dressing room they will just be enjoying the opportunity they have”, he claims. Clyne is into the last eighteen months of his Liverpool contract, but while the Reds wrestle with Manchester City for the title, the Londoner is remaining quietly confident about his career at Anfield. “I haven’t really spoken [to Klopp] or thought about what’s going to happen at the end of the season”, Clyne told Sky Sports. With Liverpool entertaining Watford on Wednesday night, Trent is likely to resume his right-back duties for the home game against the Hornets. It’s not likely that we’ll be missing Clyne too much, despite some pundits and fans criticising Klopp for shipping Clyne out in January. It seemed clear that the Londoner wasn’t overly keen on competing for a place with Trent, and, as Klopp only wants men committed to the cause, at the time it didn’t seem like such a bad idea to let him go. We’ll wish him all the best at Bournemouth, and thank him for his words, but it’s on the players Klopp has at his disposal now to get the job done and deliver this team, and us Reds, that long-awaited league title.